I don't usually take on caricature commissions very often. Usually, as in the case of these, they're done for either friends or associates. The first two are of the same person. One (the pencil sketch) was done as a Christmas present from his girlfriend and the second (the Simpsons version) was done at his own personal request. The other caricature below, is done with my older approach (one which crams as many personal interests of the client in the one picture). Luckily the guy was a good sport about the crater in his nose (considering his nickname is 'Bunker nose' I could have taken the exaggeration to greater extremes). This was a freebee job, as my services were raffled off as a prize at a charity function. Awesome work Chris, your line work is so outstanding! I really love the first drawing above, very nice! Great stuff! 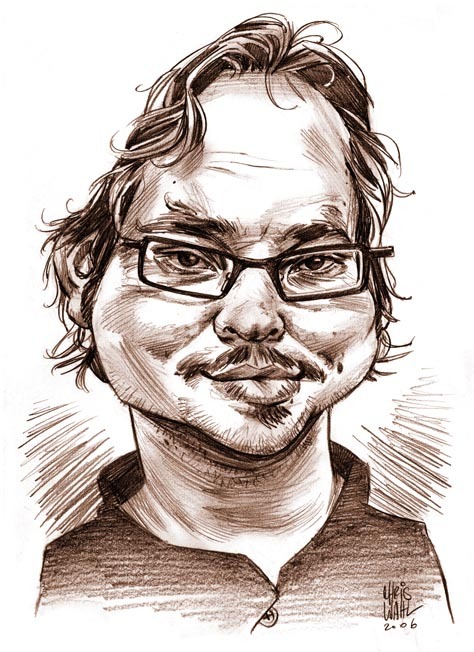 I really love your caricatures, Chris. That top one is my favorite too! Hey Chris... these are great.... PEACE! Love the Simpson style cartoon! Wow man, wish I had a caricature like that. It gives me the inspiration to start some basic doodling of my own. Good work. These are great! I really like the lines in the first one. I also never realised that people would be interested in seeing a Simpsons version of themselves...very clever! How long did it take for you to turn each of these out? Hope you don't mind the double comment. 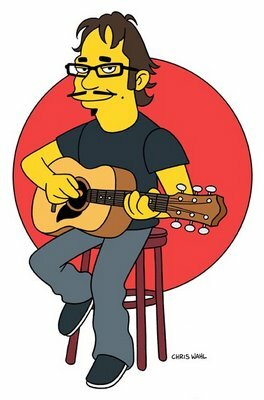 Finally after spending a night searching for Simpsonesque models, I managed to create this caricature of myself. Please leave any suggestions. Appreciate for the inspiration. Hey, thanks for the comments everyone. forbes- The first one was the the quickest to do- about 90 minutes. The Simpsons about 150minutes and the final one about 3 hours. Kirtan- Your Simpsons caricature looks great! The best thing I found was to get some good Simpsons reference from the internet (I found a pic with about 100 characters in it), and then use the reference sort of like a police identikit. Look for a character with similar eyes to you, and draw that, then the nose, mouth, face shape etc. you're an animal! a drawing beast! never stop showing us your work. haha I kinda laughed when I saw that big dent in the guy's nose. Man you're talented as hell. You are so good at these caricatures it's amazing! That guy's neck is amazing. You have a terrific ink line! I have been following your blog regularly for some time and I love all of them. I was wondering, if you are planning on digital coloring tutorial. Damn I like the line in the first one! 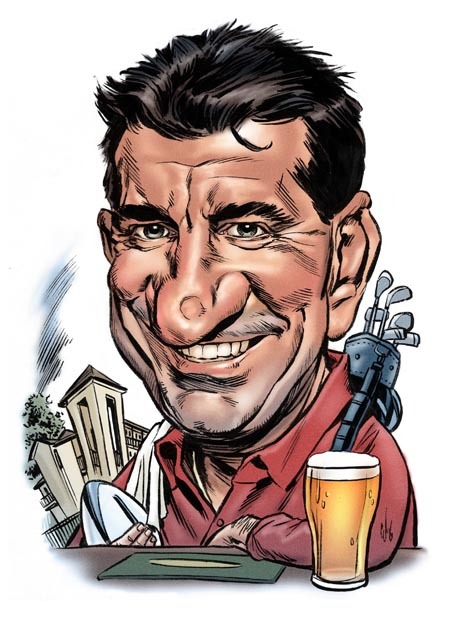 Chris, amazing job as always on these caricatures. Really like all of them. Great jobs! very funny the Simpson`s version but I prefer the first. Congrats! haven't been around these nek-of-da-woods in awhile! great work as always mang!! These are all great! Nice stuff. Very bold style. Hey everyone! Been super busy and have had to neglect my blog for the time being. I always appreciate everyone's comments. Great to hear from the regulars and the newcomers. I'm Gonzalo Facio, argentinian caricaturist. I hope that you can see my blog. I added your blog in my links. today I have found your treasure blog and I feel like starting drawing again. Thanks for your amazing art and generous suggestion and behind the scene stuff. You totally rock, keep this great blog alive and kicking. Great stuff Chris. Your daughtsmanship is second to none! Great stuff, and those tutorials rock. You, bright and sharp artist! How do you feel about mastering all those skills? Gonzalo- You Blogger profile isn't active for me to view your blog. But after a quick internet search I found some of your work. Fantastic caricatures, Gonzalo. Great work. Luca- Thanks mate! I'm glad to have inspired you in some way. Makes this all worthwhile. Marco- Thanks! Always enjoy seeing your digital speedpaintings. Ismael- Thankyou. Thanks for the link exchange offer. Even though your work is amazing, I'm being very selective about my links at the moment. Michael- Heh thanks. I'm a Jack-of-all-trades, master of none. ...and if it helps I'm a terrible, terrible painter. John- ...I'd like to thank my short attention span for making me the diverse artist I am today.